As you look back on the summers of your childhood, you’ve likely attended a fair or two. Fairs often signal the end of summer and the impending new school year. While there are thousands of fairs across the United States every year, these 10 states continue to have the largest attendance numbers. From mind-blowing food to livestock education, here’s a quick breakdown of the top ten biggest state fairs* in America. The old saying “everything is bigger in Texas” is especially true of its fairs. The State Fair of Texas runs for an impressive 24-day span, and welcomes more than 2 million visitors annually. Big Tex, the official icon of the State Fair of Texas, greets visitors as the enter the gates and begin their adventure at the largest state fair in America. Held in Dallas at Fair Park, a registered National Historic Landmark, this fair is more than just food and rides. Attendees can expect to learn about the Lone Star State’s rich history and traditions through educational exhibits on agriculture and livestock, as well as art, culture, and science museums. As with any state fair, you’ll find loads of midway rides, attractions, live music, events, and all the fried food you could ever want. Throughout the duration of the fair, you can also attend the Texas Auto Show, and football fans can attend several collegiate football games at Cotton Bowl Stadium, located inside Fair Park. Commonly referred to as the “Great Minnesota Get-Together,” The Minnesota State Fair is the second largest fair in America. Since the first official fair in 1859, Minnesotans and other Midwesterners visit the Minnesota State Fairgrounds each year to celebrate the history of the Land of 10,000 Lakes. Most famous for Sweet Martha’s Cookies, Tom Thumb’s mini donuts, deep fried cheese curds, The Pronto Pup corn dog, and turkey legs, the Minnesota State Fair has 300+ concession booths offering 500+ food options. Keep an eye out for the official mascot of the fair: Fairchild the gopher. Also known as the Eastern States Exposition, The Big E includes all 6 New England States: Connecticut, Maine, Rhode Island, Massachusetts, Vermont, and New Hampshire. The fair is held in Massachusetts and hosts “state days” that allow each state to showcase their individual history and traditions. The Big E has fried just about any food imaginable, and has all the traditional fair food staples. Don’t forget to end your meal with a Big E Cream Puff, the fair’s signature dessert! In 1841, the United States held its first state fair in Syracuse, and that fair evolved into the Great New York State Fair in 1967. Multiple music stages make for some of the best summer lineups with performances by both new and seasoned artists! Visitors will be happy to know that the Taste NY Marketplace will once again be back! Attendees will sample food and beverage products made right in New York State. The fair kicks off in late August and will conclude in early September. You may be thinking that Tulsa isn’t a state…and you’d be right. Oklahoma has two state fairs each year, the Tulsa State Fair and its smaller rival, the Oklahoma State Fair. What began as the Tulsa County Free Fair has evolved into Oklahoma’s biggest family event of the year! The Tulsa State Fair runs for eleven days and hosts educational experiences, along with good ol’ fashioned family fun! To kick off the fair, Disney on Ice will perform in the Pavillion! The Arizona State Fair was established in 1905 with the intent of being a gathering place for the community. Growing to over one million attendees annually, people from all corners of the state come together during this three-week fair. 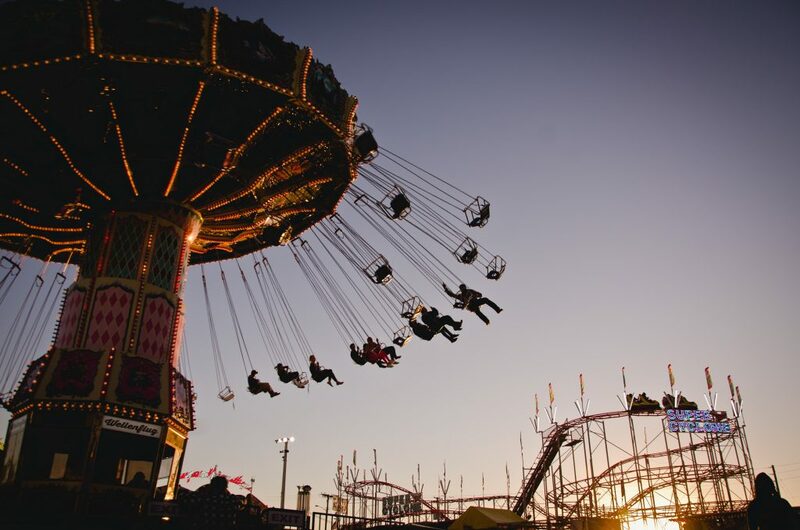 With numerous concerts, live entertainment, festival rides, fair food, and educational exhibitions, this southwest state fair takes place in Phoenix at the beginning of October. The Iowa State Fair is the largest event in the entire state and celebrates Iowa’s agriculture, industry, entertainment, and achievement. This fair is even claimed to be the inspiration for a novel and three movies! Rated as one of the best state fairs in the nation, the Iowa State Fairgrounds gates welcome more than a million local, regional, and international visitors annually. On top of free entertainment and attractions, the Iowa State Fair offers a wide variety good eats, including their 50+ “mobile food on a stick” options! Fun fact: Iowa’s State Fair is home to the world-famous Butter Cow, weighing about 600 pounds and standing 5.5 feet tall, a tradition started in 1911 that has been carried on by only five sculptors over the years. The Wisconsin State Fair occurs for eleven days each year at the Wisconsin State Fair Park. Take a ride on the Wonderfair Wheel (North America’s largest traveling Ferris Wheel), browse art exhibits, wander through Exploratory Park, or visit the House of Moo to learn more about Wisconsin’s dairy industry. If you find yourself heading to the fair this August, be sure to try their famous cream puffs! According to their website, the puffs have been sold since 1924, and an average of 350,000 are consumed annually. The Sporkies, the Wisconsin State Fair annual food competition, tests out some of the newest foods featured at the fair. Looking to try something new? The Crazy Grazin’ days allow you to sample smaller portions of food at 50+ vendors. Hosted in Raleigh, North Carolina, The North Carolina State Fair highlights the state’s agriculture through both educational and interactive exhibits. The fair features rides, numerous competitions ranging from graphic design to horse shows, and flaunts entertainment events, including their Folk Festival. There’s 100+ free things to do at the fair, as well as new food options, and is a perfect fall activity for the whole family! The Washington State Fair has just over one million attendees annually, and has grown significantly since the very first fair in 1900. Originally the Valley Fair, later the Puyallup Fair, and eventually the Washington State Fair, this fair may have held several names, but its mission has not changed: providing an experience centered on animals, agriculture, and education. As fair-goers “do the Puyallup” they can participate in farming simulations; watch rodeos, parades, and stunt shows; listen to free music and a knockout concert series; and view firework shows on Friday nights! If you’re lucky enough, you might get to meet Big Washington, the fair’s elusive bigfoot mascot! *Please note that we only included state fairs, and did not include county fairs, etc.